Whenever you click on something, there is a very good chance that what you clicked on is a button. This is not something specific to just Flash - almost all applications use buttons for doing something. 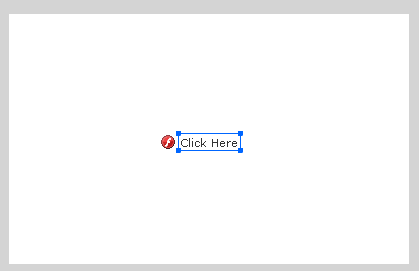 Given how common place they are, lets use this tutorial as a way of familiarizing ourselves with buttons in Flash! In the above example, I have a small button made up of some image and text. Play with the button by hovering over it with your mouse and clicking on it. There are two things I want you to notice. First, notice that the look of the button changes as you mouse over and click it. Second, depending on whether you are mousing over or clicking, some text below changes to display what action you just performed. You cannot copy and paste an image into Flash from your browser. Instead, you have to save the image to your hard drive and then insert it by dragging/dropping from your hard drive and into your document or by going to File | Import | Import to Stage. Once you have done this hit OK to accept the changes you have made and to close the Convert to Symbol dialog. Looking in your Properties panel paints a much clearer picture. What you have selected is now a button - as you would have expected after having completed the previous step. 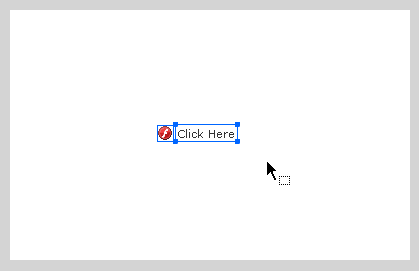 The only visual indicator you have that this is a button is the mouse cursor changing. We want go a bit further, so let's look into that starting on the next page.